My favorite from Sharalee is the tree branch one...I have that same fabric! That beetle is stunning! I appreciate how the legs are articulated up near the body. Supurb! I'm so glad you like the patch, Wulf! . The body is printed fabric, with embroidered embellishment. 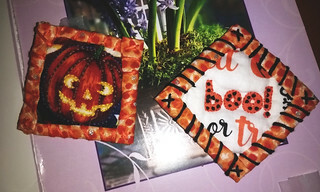 got my wonderful patches from JoyfulClover - thank you so much. The stitching is wonderful on R2D2 love the modern take on only including part of the image. and the distressed look of the Enterprise with the photo transfer is very nice. Love them both - thank you. I received the absolute bestest patch from craftADDchick yesterday!! LOOK THAT THAT AWESOMENESS!!! But wait... it get's better!!! It's... INTERACTIVE!!! And then she sent 2 cute small ones (Halloween) as well... inchies/twinchies in betweenies.. The snaps are brilliant! That IS a great patch! craftaddchick, I seriously don't know how you do it. You are always so friendly, always have so much to do, and are so freakin' darn creative!!! 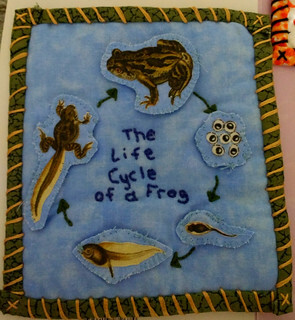 I love the frog patch you made! 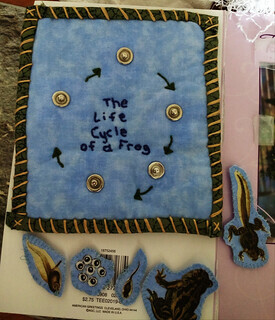 The frog patch is the greatest!